It has been just more than a year since Teresa Halleck joined as president and CEO of San Diego County Credit Union (SDCCU), San Diego’s largest locally-owned financial institution. Under Halleck’s leadership, SDCCU has continued to remain a top financial performer in the industry while balancing service and convenience, and driving efficiency in operations. During the past year, SDCCU’s diverse customer base grew from approximately 209,000 to 217,000 while assets have increased to $5.2 billion. Halleck came to SDCCU from Sacramento-based The Golden 1 Credit Union, where she served for nearly eight years as president and CEO. During her tenure at Golden 1, the credit union grew from $4.2 billion in assets with 65 branches to in excess of $7 billion in assets and 84 branches. Halleck was credited with expanding Golden 1’s field of membership, enhancing its products and service offerings and increasing the credit union’s visibility in its chosen markets while maintaining a consistent focus on exceptional member service. Halleck remains very involved in the credit union industry while serving on several boards and committees, including as a board and executive committee member of the California Credit Union League (CCUL) and as a committee member of the Department of Financial Institutions’ Credit Union Advisory Committee. Earlier this year, Halleck hosted a meeting at SDCCU’s administrative office with industry leaders and officials from the Consumer Financial Protection Bureau which is the Obama Administration's new agency to regulate consumer protection. 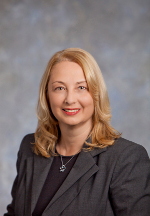 Halleck’s educational background includes a bachelors of science in accounting from the University of Maryland at College Park, and a master’s in financial management from The Johns Hopkins University.